Kyphosus sectatrix has a widespread distribution inhabiting rocky and coral reefs from warm waters around the world, from the West Pacific to the East Pacific (including the Revillagigedo Archipelago), the Indian Ocean, the Red Sea, the Atlantic and the Mediterranean. On March 2016, during an expedition to Clarion Island, Revillagigedo Archipelago, we observed an individual of K. sectatrix with abnormal body coloration, entirely white with black eyes, a condition known as partial albinism. This contrasts with the xanthic condition (entirely yellow or with black blotches) commonly observed in K. sectatrix at the Revillagigedo Archipelago. This specimen represents the first documented record of partial albinism in K. sectatrix for the Mexican Pacific. Kyphosus sectatrix se distribuye ampliamente en aguas cálidas de todo el mundo, desde el Pacífico occidental hasta el Pacífico oriental (incluyendo el archipiélago de Revillagigedo), el océano Índico, el Atlántico, el mar Rojo y el Mediterráneo, habitando arrecifes rocosos y coralinos someros. En marzo de 2016, durante una expedición científica en isla Clarion, archipiélago de Revillagigedo, observamos a un individuo de K. sectatrix con una coloración anormal, cuerpo enteramente blanco con ojos negros, anormalidad conocida como albinismo parcial; una condición contraria al xantismo (completamente amarillo o con manchas negras) conmumente observado en poblaciones de K. sectatrix. Este registro representa el primer reporte de albinismo parcial en K. sectatrix para el Pacífico mexicano. The perciform genus Kyphosus Lacepéde, 1801 inhabits rocky and coral reefs from subtropical waters in both the Southern and Northern hemispheres (Knudsen & Clements, 2013; Sakai & Nakabo, 2014). The genus contains 11 valid species sensu Knudsen & Clements (2013, 2016), but the taxonomy of Kyphosus remains confusing and controversial to the point that several subgenera and subspecies have been erected and further synonymized (Gilbert, 2015; Knudsen & Clements, 2013; Sakai & Nakabo, 2014). Undoubtedly, the genus is still in need of a detailed review. The Revillagigedo Archipelago harbors 4 species of Kyphosus: K. elegans, K. sectatrix, K. vaigiensis, and K. ocyurus (Knudsen & Clements, 2016; Robertson & Allen, 2015). Kyphosus lutescens was described as an endemic species from the Revillagigedo Archipelago by Jordan & Gilbert (1882) based on material collected from Socorro Island (holotype apparently lost); however, recent reviews using meristic characters and molecular markers by Knudsen & Clements (2013, 2016) suggest that the species is a junior synonym of K. sectatrix (Linnaeus, 1758), although Del Moral-Flores et al. (2016) mention that it should be considered as K. lutescens, without offering solid evidence. In particular, K. sectatrix has a circumtropical distribution inhabiting rocky and coral reefs from the eastern Pacific and across the Pacific Ocean to the Indian Ocean, including oceanic islands such as Revillagigedo and Hawaiian archipelagos, Easter Island, and south to northern New Zealand, the Red Sea and the eastern and western Atlantic and the Mediterranean (Knudsen & Clements, 2013, 2016; Roberson & Allen, 2015). Morphometric (i.e., head width, pectoral fin length, isthmus width) and meristic characteristics (i.e., dorsal fin spines, dorsal fin rays, total number of gill rakers) are key to distinguish between species (Knudsen & Clements, 2016); but also, coloration and some color patterns. K. sectatrix is often grey to silvery with weak horizontal lines of slightly golden colored scales along the body. Often with a white or silvery streak on the cheek underneath the eye. Occasionally, the entire body is distinctively yellow, or with blotches or patches of black and yellow, known as ‘xanthism’ (Knudsen & Clements, 2013, 2016), or pale color (Randall, 2007). Xanthism in K. sectatrix is common at isolated oceanic islands in the Pacific Ocean such as Middleton Reef, the Kermadec Islands, Ogasawara Islands, Revillagigedo Islands, Easter Island, and the Hawaiian Islands (Knudsen & Clements, 2013, 2016), but less common in the Atlantic and Indian Ocean, the Azores and the Trindad Archipelago (Carvalho, 1950; Santos et al., 1997). Anomalous body coloration in fishes usually occurs either as a deficiency of pigmentation known as “albinism” or as an excess called “hypomelanosis” or “melanism” (Jawad et al., 2013; Simon et al., 2009); whereas a particular form of albinism called xanthism is phenotypically expressed as a bright yellow or orange body coloration (e.g., Amaoka, 1995; Carson, 2011; Lewand et al., 2013). Albinism ocurrs in 2 forms: i) complete albinism, where the integumentary and retinal pigmentation is absent and ii) partial albinism or leucism, where there is a partial or complete loss of integumentary pigments, but the retinal pigments are present (Bottaro et al., 2008; Muto et al., 2013; Sandoval-Castillo et al., 2006; Reum et al., 2008). 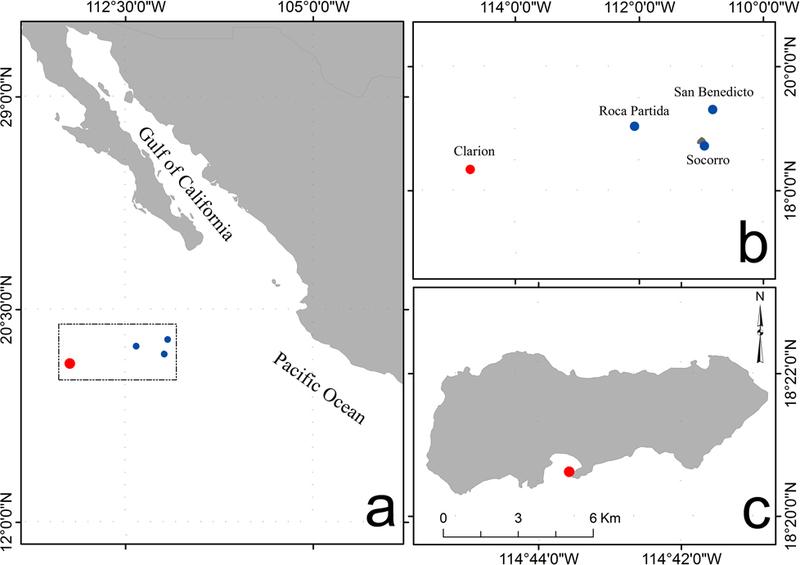 The present note reports the occurrence of partial albinism in an individual of the Revillagigedo sea chub K. sectatrix observed at Clarion Island, Revillagigedo Archipelago, Mexico. Clarion Island is located inside a Natural Protected Area, the Revillagigedo National Park. On March 2016, while working with reef-related cryptic fish species in Clarion Island (Fig. 1; 18°20’37.51” N, 114°43’34.28” W), we observed 1 specimen of the Revillagigedo sea chub K. sectatrix exhibiting a rare example of abnormal body coloration. The specimen was seen and photographed on a rocky reef, at 10 m depth. We identified the specimen based on photographs and using illustrated guides by Humann & DeLoach (2004) and Robertson & Allen (2015). For valid names and systematics we followed Knudsen & Clements (2013, 2016). 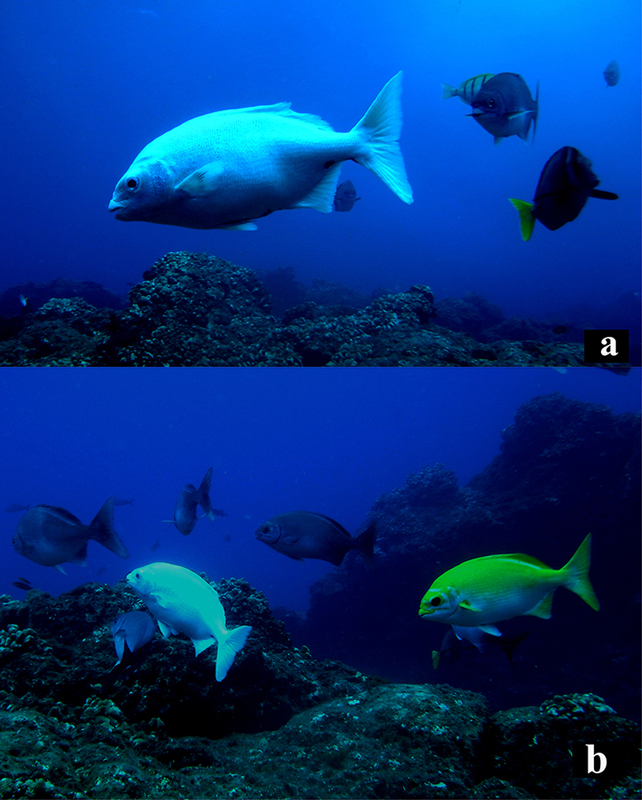 Figure 1. a, Study area in the Mexican Pacific; b, Revillagigedo National Park; c, observation of K. sectatrix with partial albinism in Clarion Island, Revillagigedo Archipelago. The body of the specimen observed was completely white, with small black blotches on the base of pelvic and caudal fins; eyes were black in color (Fig. 2a). The white Revillagigedo sea chub was observed inside a school of specimens with normal (grey-silvery) and xanthic coloration (yellow) (Fig. 2b). Abnormal color in this specimen coincides with description of teleost fishes with abnormal coloration (e.g., Kwun et al., 2016; Mansur, 2011; Muto et al., 2013, 2016) related to a dysfunctional melanin pigmentary system known as partial albinism. For the first time, we report this abnormal body coloration in K. sectatrix specimens in Mexican Pacific waters. This rare condition has been observed, but not reported, in other islands from Revillagigedo Archipelago such as Socorro Island, Roca Partida and San Benedicto (Ayala-Bocos pers. comm., 2016), hence the sea chub population with partial albinism in the archipelago includes several specimens. The specimen was photographed and not captured, and therefore, not measured, but it was similar in both size and shape to the rest of the school formation members of K. sectatrix as inferred from the images (Fig. 2b). Figure 2. a, Partial albinism in Kyphosus sectatrix observed at Clarion Island; b, school of K. sectatrix with normal coloration, partial albinism and xanthic coloration. Abnormal body coloration is related to several causes such as gene expression (Hernández & Sinovcic, 1987), diet deficiency (Kanazawa, 1993), variations in environmental conditions (Aritaki & Seikai, 2004), disorders in thyroid hormone (Okada, 2005) or dysfunctional melanin pigmentary system (Kinnear et al., 1985; Reum et al., 2008). This rare condition has been recorded in cartilaginous fishes from the Mexican Pacific such as Myliobatis californica (De Jesús-Roldán, 1990), Galeocerdo cuvier and Narcine entemedor (Sandoval-Castillo et al., 2006), Dasyatis longa (Escobar-Sánchez et al., 2009), Prionace glauca (Galván-Magaña et al., 2011), Carcharhinus obscurus (Bejarano-Álvarez & Galván-Magaña, 2013), and Carcharhinus limbatus (Sancho-Vázquez et al., 2015); but has also been reported for teleost fishes such as Haemulon sexfasciatus (Aguilar-Palomino et al., 1995) and Istiophorus platypterus (Vidaurri-Sotelo et al., 2005). Although Randall (2007) suggests that K. sectatrix can have a pale coloration, even white, this had never been recorded in Mexican Pacific waters. Xanthic coloration in K. sectatrix is common at isolated oceanic islands such as Ogasawara, Japan (Masuda et al., 1984), the Revillagigedo Archipelago, Mexico (Gotshall, 1998), the Hawaiian Islands, United States (Randall, 2007) and Easter Island, Chile (Randall & Cea, 2010). In the Revillagedo Archipelago, we observed this condition in several species of teleost fishes such as Cephalopholis spp., Epinephelus spp., Arothron spp., Calotomus spp. and Nicholsina spp. In contrast, albinism is a rare condition and only has been recorded in 2 species along Mexican Pacific waters (H. sexfasciatus and I. platypterus). We express our sincere gratitude to the Mexican Navy (Secretaría de Marina-Armada de México) for their invaluable logistical assistance providing maritime transportation to and from the Revillagigedo Islands, along with lodging and field work assistance during our stay in Clarion Island, Marine Naval Station. We sincerely thank Admirals J. P. Ladino-Bonilla and C. H. Lanz-Gutiérrez, and all personnel stationed at Revillagigedo. We appreciate the logistic support of Salvador Romero, David Tafolla-Venegas and Yareli López-Arroyo. Research permits were granted to JEMG by the Wildlife Ministry (DGVS; SGPA/DGVS/02920/15 and SGPA/DGVS/12333/15) and approval of the Interior Ministry (SEGOB; UG/211/0320/2015 and DICOPPU/211/164/2016). This report was supported by grants from Conacyt to ODD (#240875), ALP (#236654) and doctoral fellowship to OVM (#401738). Aguilar-Palomino, B., Rodríguez-Romero, J., & Abitia-Cárdenas, L. A. (1995). Albinismo en el burrito, Haemulon sexfasciatus (Osteichthyes: Haemulidae), Baja California Sur, México. Revista de Biología Tropical, 43, 328–329. Amaoka, K. (1995). Two xanthic specimens of the flounder, Microstomus achne (Jordan & Starks), from off Toi-Cho, Tsugaru Strait, Hokkaido. Izu Oceanic Park Diving News, 6, 2–5. Aritaki, M., & Seikai, T. (2004). Temperature effects on early development and occurrence of metamorphosis-related morphological abnormalities in hatchery-reared brown sole Pseudopleuronectes herzensteini. Aquaculture, 240, 517–530. Bejarano-Álvarez, O. M., & Galván-Magaña, F. (2013). First report of an embryonic dusky shark (Carcharhinus obscurus) with cyclopia and other abnormalities. Marine Biodiversity Records, 6, 1–4. Bottaro, M., Ferrando, S., Gallus, L., Girosi, L., & Vacchi, M. (2008). First record of albinism in the deep-water shark Dalatias licha. Marine Biodiversity Records, 1, 1–4. Carson, E. W. (2011). Low but stable frequency of xanthic phenotypes in a population of the twoline pupfish, Cyprinodon bifasciatus. The American Midland Naturalist, 166, 462–466. Carvalho, J. P. (1950). Resultados científicos do cruzeiro do “Baependi” e do “Vega” à Ilha da Trindade: Peixes. Boletim do Instituto Paulista de Oceanografia, 1, 97–133. De Jesús-Roldán, M. (1990). An albino bat ray, Myliobatis californica, from the Pacific coast of Baja California Sur, Mexico. California Fish and Game, 76, 126–127. Del Moral-Flores, L. F., García-Negrete, J. M., & Guzmán-Camacho, A. F. (2016). Peces del archipiélago de las islas Revillagigedo: una actualización sistemática y biogeográfica. Biología, Ciencia y Tecnología, 9, 596–619. Escobar-Sánchez, O., Galván-Magaña, F., Downton-Hoffmann, C.A. Carrera-Fernández, M., & Alatorre-Ramírez, V. G. (2009). First record of a morphological abnormality in the longtail stingray Dasyatis longa (Myliobatiformes: Dasyatidae) in the Gulf of California, Mexico. Marine Biodiversity Records, 2, e26. Galván-Magaña, F., Escobar-Sánchez, O., & Carrera-Fernández, M. (2011). Embryonic bicephaly in the blue shark, Prionace glauca, from the Mexican Pacific Ocean. Marine Biodiversity Records, 4, 1–4. Gilbert, C. H. (2015). Designation of a neotype for the kyphosid fish Kyphosus sectatrix (Linnaeus, 1758). Zootaxa, 3999, 295–297. Gotshall, D. W. (1998). Sea of Cortez marine animals: a guide to the common fishes and invertebrates Baja California to Panama. Monterey, California: Sea Challengers. Hernández, V. A., & Sinovcic, G. (1987). A note on a partial albino specimen of the species Liza (Liza) ramada (Risso, 1826) caught from the middle Adriatic. Institut za Oceanografiju i Ribarstvo, 68, 1–4. Humann, P., & DeLoach, N. (2004). Reef fish identification: Baja to Panama. Jacksonville: New World Publications. Jawad, L. A., Al-Shogebai, S., & Al-Mamry, J. M. (2013). A reported case of malpigmentation in the spangled emperor Lethrinus nebulosus (Osteichthyes: Lethrinidae) collected from the Arabian Sea coasts of Oman. Thalassia Salentina, 35, 29–35. Jordan, D. S., & Gilbert, C. H. (1882). Notes on a collection of fishes made by Lieut. Henry E. Nichols, U. S. N., on the west coast of Mexico, with descriptions of new species. Proceedings of the United States National Museum, 4, 225–233. Kanazawa, A. (1993). Nutritional mechanisms involved in the occurrence of abnormal pigmentation in hatchery-reared flatfish. Journal of the World Aquaculture Society, 24, 162–166. Kinnear, P. E., Jay, B., & Witkop, C. J. (1985). Albinism. Survey of Ophthalmology, 30, 75–101. Knudsen, S. W., & Clements, K. D. (2013). Revision of the fish family Kyphosidae (Teleostei: Perciformes). Zootaxa, 3751, 1–101. Knudsen, S. W., & Clements, K. D. (2016). World-wide species distributions in the family Kyphosidae (Teleostei: Perciformes). Molecular Phylogenetics and Evolution, 101, 252–266. Kwun H. J., Park, J., & Kim, H. S. (2016). First record of partial albinism in the prickleback Dictyosoma rubrimaculatum (Perciformes: Stichaeidae). Marine Biodiversity, 46, 943–945. Lewand, K. O., Hyde, J. R., Buonaccorsi, V. P., & Lea, R. N. (2013). Orange coloration in a black-and-yellow rockfish (Sebastes chrysomelas) from central California. California Fish and Game, 99, 237–239. Mansur, L. E. (2011). First record of partial albinism in the temperate rocky reefs fish Acanthistius patachonicus (Insertae sedis) off southwestern Atlantic Ocean. Pan-American Journal of Aquatic Science, 6, 185–187. Masuda, H., Amaoka, K., Araga, C., Uyeno, T., & Yoshino, T. (1984). The fishes of the Japanese Archipelago. Tokyo: Tokai University Press. Muto, N., Noda, T., Kai, Y., & Nakabo, T. (2013). First record of albinism in the rockfish Sebastes pachycephalus complex (Scorpaeniformes: Scorpaenidae). Ichthyological Research, 60, 195–197. Muto, N., Takayama, K., & Kai, Y. (2016). First record of abnormal body coloration in a rockfish Sebastes trivittatus (Scorpaenoidei:Sebastidae). Ichthyological Research, 63, 197–199. Okada, N. (2005). Development of tissues involved in eye migration and role of thyroid hormone in metamorphosing Japanese flounder (Paralichthys olivaceus). Scientific Reports of the Hokkaido Fisheries Experimental Station, 68, 1–43. Randall, J. E. (2007). Reef and shore fishes of the Hawaiian Islands. Honolulu: Sea Grant College Program, University of Hawaii Press. Randall, J. E., & Cea, A. (2010.) Shore fishes of Easter Island. Honolulu: University of Hawaii Press. Reum, J. C. P., Paulsen, C. E., Pietsch, T. W., & Parker-Stetter, S. L. (2008). First record of an albino chimaeriform fish, Hydrolagus colliei. Northwestern Naturalist, 89, 60–62. Robertson, D. R., & Allen, G. R. (2015). Peces costeros del Pacífico Oriental Tropical: sistema de información en línea. Instituto Smithsonian de Investigaciones Tropicales, Balboa, República de Panamá. Retrieved on Mach 03th, 2017 from: http://biogeodb.stri.si.edu/sftep/es/pages. Sakai, K., & Nakabo, T. (2014). Taxonomic review of Kyphosus (Pisces: Kyphosidae) in the Atlantic and Eastern Pacific Oceans. Ichthyological Research, 61, 265–292. Sancho-Vázquez, F., Del Moral-Flores, L. F., & Mendoza-Vargas, O. U. (2015). Albinismo parcial en un embrión de tiburón puntas negras, Carcharhinus limbatus (Carcharhinidae: Chondrichthyes) del Pacífico oriental. Latin American Journal of Aquatic Research, 43, 274–276. Sandoval-Castillo, J., Mariano-Meléndez, E., & Villavicencio-Garayzar, C. (2006). New records of albinism in two elasmobranchs: the tiger shark Galeocerdo cuvier and the giant electric ray Narcine entemedor. Cybium, 30, 191–192. Santos, R. S., Porteiro, F. M., & Barreiros, J. P. (1997). Marine fishes of the Azores: annotated checklist and bibliography. Arquipélago, Life and Marine Sciences, 1, 1–244. Simon, T., Joyeux, J. C., & Macieira, R. M. (2009). First record of partial melanism in the coney Cephalopholis fulva (Perciformes: Epinephelidae). Brazilian Journal of Oceanography, 57, 145–147. Vidaurri-Sotelo, A. L., Macías-Zamora, R., & Gallardo-Cabello, M. (2005). Albinism in Sailfish (Istiophorus platypterus) found in the Coast of Colima, Mexico. Pakistan Journal of Biological Sciences, 8, 669–671.